Feeling bored this coming weekend? Tired of the usual dinner and movie with family, friends and love ones? And the best part? You do not need any visual instrument. Just your eyes will do! If you have smart phone or tablet, install sky map apps in it and just point your phone/tablet at the sky. For Android phones and tablets, you may install the free Sky Map from Google Play. For Apple iPhone and iPad running iOS5, you may install the free Stellarium. Else, if you don't mind paying for such apps, try Starmap, Star Walk or GoSkyWatch. If you do not have a smart phone/tablet, you can download and print out this August 2012 sky map suitable for use in Singapore. This is the most reliable and highly anticipated meteor showers of the year. The best time to catch it is during its peak activity period which is this coming weekend, how convenient! Look at North East direction in the sky from about 11pm onwards. As the night progresses, use your phone/tablet star map to find out where the constellation Perseus is and look in that general direction. Sit down a reclining chair or just lie down on a groundsheet to make yourself comfortable looking at as wide a portion of the North East sky as possible to increase your chances of spotting them. Bring some warm clothing and insect repellent. Listening to music while hunting for meteors is a great way to relax too. Meteors can move very fast and be literally gone in a flash. - make a note of your meteor observations and compare them with other meteor observers in the world - e.g. what time you saw each of them, its brightness, colour, spotted near which constellation, ...etc. - take time-lapse photography of the sky and try to capture a meteor or two. Look West after the sky gets dark for 3 "stars" that forms a triangle. The whitish looking star to the left of the triangle is Spica, the one on the right is Saturn, the reddish "star" at the bottom is Mars. On early Sunday morning 12 August 2012 before sunrise from about 3.08 AM, start looking at the top edge of the Moon which will be rising from the East. Jupiter which look like a bright star will "rise" up from the top edge of the Moon (the dark limb). If you have a telescope, trying looking at Jupiter and the craters of the Moon. Try to spot Jupiter's moon Io appearing behind Moon before the disc of Jupiter's appears. For more detail information, please read this forum thread started by Gavin at singastro forum. (4) Count stars in the 7 Sister star clusters. The 7 Sisters is a big and bright group of stars which is also known as Pleiades or M45 (Messier object #45) in your phone/table sky map apps. If the sky is clear enough, even in light polluted urban skies like Singapore, you can visually see with your unaided eyes at least 3 or 4 stars in tight group of stars. Some may spot up to 6 or 7 or even more depending on sky condition and eyesight. This weekend, it is located about 12 degrees above Jupiter at about 11 o'clock direction from Jupiter. It rises from the East at about 1:30 am. The higher it rises, the better your chances of seeing it and count its stars. It looks great in binoculars and wide field telescopes. This one is easy. Just look for the brightest "star" below (not beside) Jupiter. Venus rises above the eastern horizon at about 3:50am this weekend. Have fun impressing your date that is the Goddess of love and beauty. You will not believe your eyes how bright Venus can be if you have not seen it before. If the sky is clear, you can still see it after 7:15am in the morning blue sky! 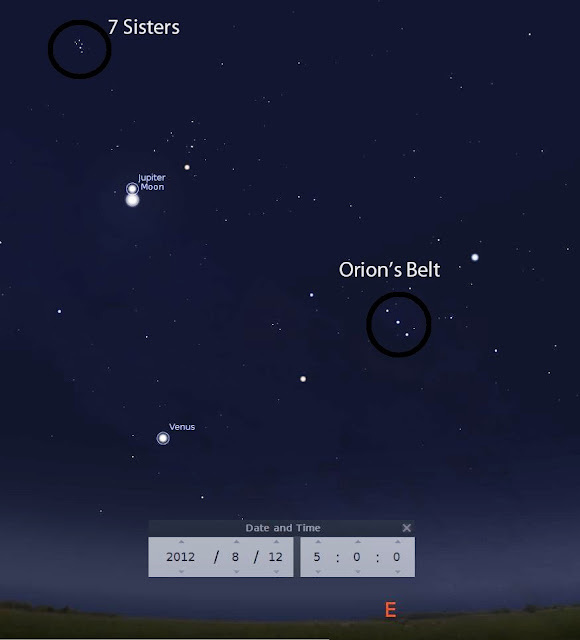 (6) See the brightest 3 stars in a line formation in the sky. That is the "belt" area of the Orion constellation (aka The Hunter) - 3 relatively bright stars in a almost perfect straight line. 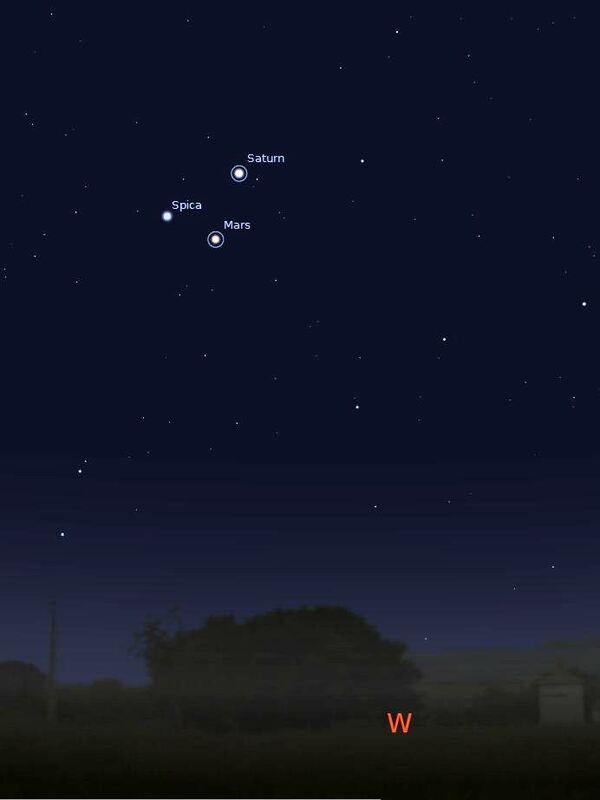 These 3 stars rises above the horizon at about 3:30am this weekend. Look at East directly and squarely. You should see them to the right of Venus. Throughout the night, do have fun identifying constellations in the sky with the help of a star map app or printed chart. You can also have fun challenging yourself by using printed star maps and compass to find them. So as you can see, if the sky is clear and you start your stargazing session from Saturday night 11 Aug till Sunday sunrise, you may have one amazing night you may remember for the rest of your life especially if you are new to stargazing! (1) Check SINGASTRO's Events & Observations forum to see if anyone is organising any stargazing session near your area or at a dark spot. (2) Friday and Saturday stargazing sessions by Galaxy Community Club (near Admiralty MRT). (3) Friday stargazing sessions by Singapore Science Centre (at Jurong). Clear skies and good luck!